The time has come to go UP! Today marked one of the highlights of my personal journey as a 'modern day adventurer' and lover of mountain-adventure stories which have inspired me climb to the lofty peaks of the Himalayas and the Alps. 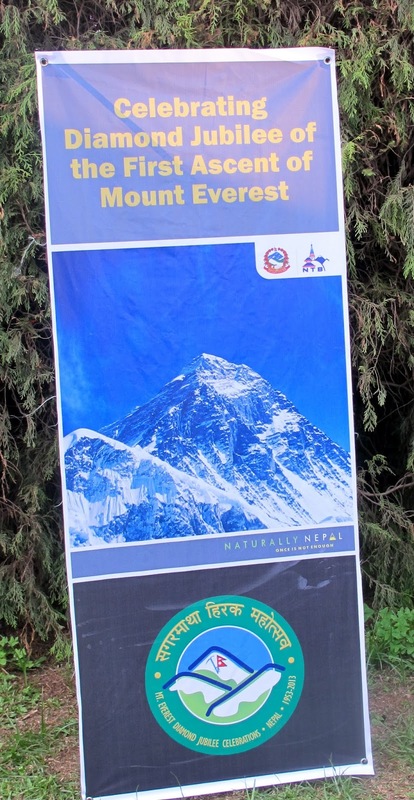 Today marks the 60th anniversary of the 1st ascent of Mount Everest with celebrations here in Kathmandu to honour the 'diamond' anniversary of first mountaineers - Edmund Hillary and Tenzing Norgay - reaching the highest point on earth on 29 May ,1953. We celebrated, in style, at the British Embassy and subsequently at the Royal Palace.... the wine was flowing, the sun was shining and the conversations inspiring... It was an absolutely BRILLIANT day from start to finish and I couldn't imagine a more perfect place to celebrate this historic occasion. 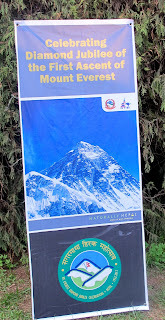 Guests included Kanchha Sherpa, the only surviving member of the 1953 team that made the first successful ascent, as well as both Sir Edmund Hillary’s granddaughter Amelia Hillary and Tenzing Norgay Sherpa’s grandson, Jamling Norgay. Also in attendance were Reinhold Messner and Lydia Bradley, who were the first man and woman to summit Everest without the use of supplemental oxygen. They had the pleasure of cutting a giant 'Everest' sized cake..! A perfect day and perfect way to end what has been a truly amazing two months.